Northern California's Picture Perfect Paradise! Can you picture it? The pristine waters of an azure lake sparkling like a field of diamonds in the summer sunlight... The breathtaking beauty of the snow-capped Trinity Alps serving as a backdrop to the stunning lake... Miles and miles of primitive shoreline to discover and explore! That is what you will find at Trinity Lake, set among the pine trees of the largest National Forest in California, the 2.2 million acre Shasta-Trinity National Forest. Trinity Lake may be the third largest water body in the state, but it's second to none in the beauty of its surroundings. Trinity boasts 16,000 surface acres with 145 miles of shoreline and a backdrop of snow-capped alpine mountains almost year round. It's these scenic vistas that draw visitors from around the world to boat, fish, photograph, and enjoy nature in its purest form. Considered one of the Prettiest Lake Settings in California... Trinity Lake is Easily one of the Most Fun as well! Beautiful Trinity Lake consists of numerous small arms, calm inlets, and a glass-like surface that makes it perfect for house-boating, water-skiing and other water sports and recreation. If your pastime is fishing then be prepared for trout, salmon, bass and catfish. The best place for first timers to catch their limit is found at the backs of coves, long points, rocky outcroppings, stump beds and the ever popular dredging piles at the north end of the lake. All of these spots are excellent places to begin your search for your trophy fish. You are also very close to some good fly fishing spots further down the Trinity River. In addition to fishing you can enjoy swimming, speed boating, water-skiing and so much more. Reserve a houseboat for the week and get the full Trinity Lake experience! 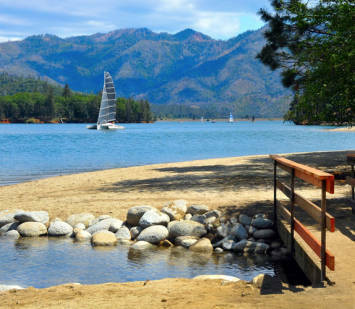 Surrounding the lake, visitors can hike the unspoiled wilderness of the Trinity Alps and the Shasta-Trinity National Forest. 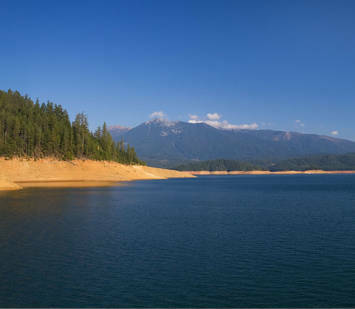 One of the highlights of Trinity Lake is that it is far less crowded and busy than it's nearby sibling – Shasta Lake. Trinity Lake provides an escape... and opportunity to reconnect with nature and your own soul. Houseboats have miles and miles of Lake Trinity shoreline to explore, sheltered by oak and pine trees, with the incredible Trinity Alpine range as a back drop. This outdoor paradise is the perfect place to find your groove. In addition to idyllic Houseboating experiences you can explore fascinating hiking trails, cast your line in some world class fishing spots and enjoy spine-tingling white water rafting adventures, depending on the season. If you don't like crowds but enjoy alpine beauty and you are a Bay Area resident you are just over 4 hours away from California's ultimate getaway for fun and a little R&R. What are you waiting for? All the Comforts of Home... Anywhere on the Lake! Trinity Lake has a full fleet of houseboats that satisfy every taste and every pocket. Groups up to 12 can be accommodated in style and comfort. Consider a 50 footer that can accommodate up to eight people with 2 bedrooms and convertible sofas. 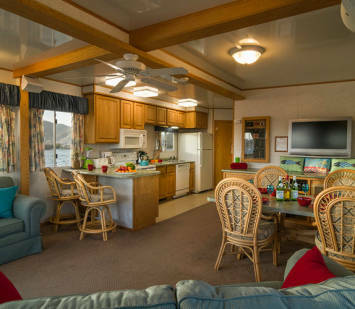 It comes with all the kitchen furnishings you will need and a full oven range and fridge and even a gas grill. Entertainment includes TV/DVD, CD and stereo. You also get air conditioning and heat if necessary. If you want to go upscale or have a larger group we have a spectacular 60 foot air conditioned houseboat that offers a very open layout to fit your group. This includes an 18 foot high ceiling with ceiling fan in the living room plus a DirecTV satellite TV for you and your guests. Four private bedrooms and sleeping for two more on the sofa bed provides sleeping accommodations for 10. You have a fully equipped kitchen that includes everything you need to prepare wonderful meals including a full size range and oven, fridge and a dishwasher to help with the "hard labor". On the top deck relax in the 6-person hot tub, a canopied area where you can enjoy the Alpine views as you sip a cocktail by your ice machine equipped wet bar before a plunge down your waterslide in to the cooler waters below and back up to your steaks cooking on the BBQ grill. You will even find a 47 gallon water toy fuel tank so you can fuel up your small watercraft without returning to the marina. As you can see today's houseboats are more like floating vacation homes – but better, you can change the scenery. 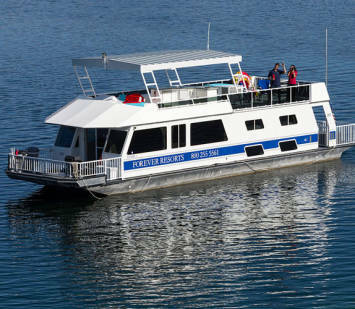 Over the years Houseboat Reservation's parent company, National Park Reservations, has helped millions of people find the ideal National Park vacation. It is that same customer driven focus we bring to assist you in finding the right houseboat, in the right location, at the right price. 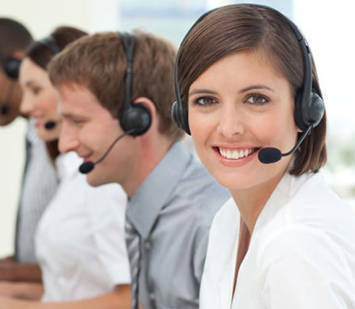 Our helpful and knowledgeable agents guarantee you the lowest price always! We can also help you with your lodging arrangements both before and after your time on the lake. We are your one stop shop. Our team of experts will help you plan your ideal houseboat vacation. We know the lakes, what's around the lakes, the houseboats, the things you need to know when planning your trip. We know the great outdoors better than anyone. Our satisfaction comes as a result of satisfied clients.